I've been playing around with coasters today. I have a new tutorial CD in the works that I'm going to be announcing hopefully tomorrow and I got it into my head that I wanted to do something a little different than what I was working on, so I created this little hanging coaster. A nice package arrived for me on my doorstep late this morning by UPS. Inside it was 3 new stamp sets. The "Define Your Life" set, the "From the Kitchen: set and the "Well Worn Alphabet" set.....all from Stampin' Up. I had an itching to ink one of the sets up so I used the "Define Your Life" set. You can click on both pictures in this post to see a larger view. I used a 4x4 inch coaster for this project and covered it with a piece of Ruby Red cardstock (after rounding the corners with my Corner Rounder punch). I swiped my Ruby Red ink pad over the cardstock for the "direct-to-paper" look. The flowers you see on the project are from a piece of patterned paper from the Ginger Blossom Designer Series paper pack. I trimmed around the flower images on one of the corners of the paper and then lined it up on the corner of the coaster. I cut a separate flower and trimmed it to fit in the upper left corner so that it balanced the designs out. 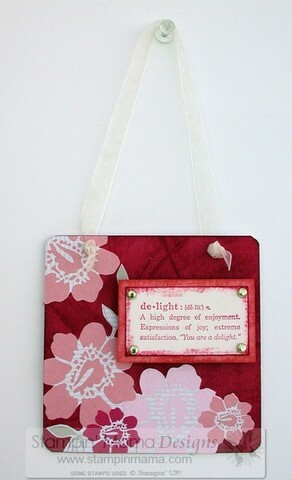 I stamped the "delight" definition image (from the "Define your Life" set) on a piece of Very Vanilla cardstock with Ruby Red ink and swiped my ink pad around the cardstock to give it a distressed look (like I did with the Ruby Red cardstock on the coaster). I mounted this on top of a piece of Groovy Guava cardstock (which was also swiped....can you tell I like that look??). I punched holes in the corners with a 1/16 inch hole punch and put gold mini brads in them. This got mounted on top of the coaster with pop-dots. Have I told you lately how much I love my Crop-A-Dile? I think it's been a few weeks since I sang the praises of this mighty-fine tool. I threaded some narrow vanilla organdy ribbon through the holes and double knotted the ends and trimmed them to make them look pretty and so they'd hold in the holes. The "Define Your Life" set is amazing......you could do a whole bunch of these little coasters with all kinds of definitions. They'd make a lovely decorating touch. This is lovely! I love the colors!! I love your little project, Erika. I have everything you used to create it, so I will do one as soon as I've crossed off everything else on my "to do" list. 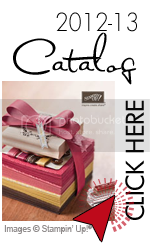 I can see that you miss the organdy ribbon, too. 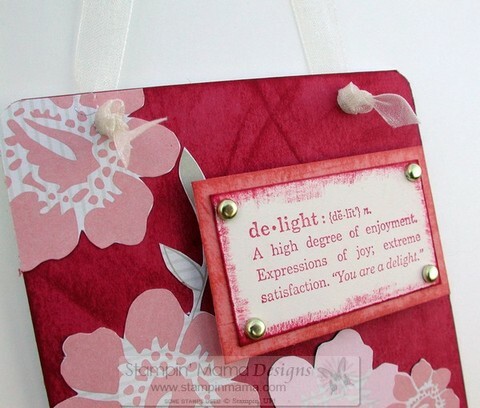 So often I wish I could use it on one of my Stampin' Up! projects. Fortunately, I did save it for my own personal projects, though, and will be able to reproduce your cool project as soon as I find the time. What a way to start my weekend! Just fabulous! Thanks for posting ideas for Stampin' Up! I know you are on the design team for other companies, but I like the SU stuff the best since I can use that for my business. Also, love the coaster idea. I made a cute photo holder using 2 coasters and a clothespin. It was a hit! Erika - What a great project. I've always been such a fan of your work - so much so that I tagged you with an award. 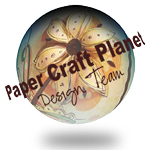 Check it out at www.cateredcrop.typepad.com. Order Stampin' UP Products Online!